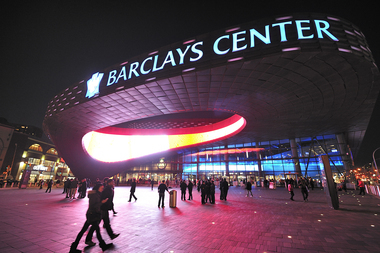 The Barclays Center is reportedly ending its deal with the Islanders hockey team. BROOKLYN — The New York Islanders are reportedly getting the boot from the Barclays Center after two seasons in Brooklyn. The Islanders, who officially moved to Flatbush Avenue from Nassau County in the fall of 2015, won’t be profitable after next season, Bloomberg first reported this week, and the arena's owners are moving to end their deal with the team. Representatives from the Barclays Center and the Islanders declined to comment on the reports. But Nassau County executive Ed Mangano confirmed to Newsday on Monday that he has spoken to Islanders owner Jonathan Ledecky about moving the team back to their former home: the Nassau Coliseum, currently undergoing renovations. “There is a path for the Islanders to return,” Mangano said. “While the decision remains with the Islanders we believe Long Island fans will make the Islanders successful in the new Coliseum,” he said. An inquiry to Mangano’s office on Tuesday was not immediately returned. The Islanders first announced their move to Brooklyn in 2012, saying they made an “ironclad,” 25-year agreement with the arena. But since then, attendance has been low. According to NHL attendance data, the Islanders had an average of 12,828 spectators at games so far in the 2016-2017 season, the third lowest in the league. That average is down 6 percent from the 13,626 fans at games in the 2015-2016 season and down 16 percent since the 15,334 fans at each game two years ago — when the team still played on Long Island.